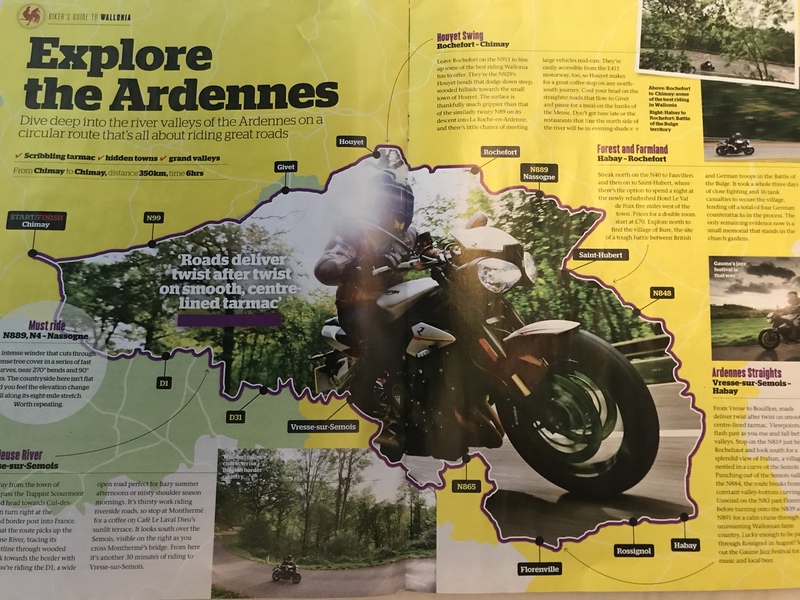 I am considering nipping over to Southern Belgium (Wallonia) for a three day jaunt with a couple of mates in mid May after reading a 'Bikers Guide to Wallonia' supplement that came in Bike magazine a few months ago. I hope to do a few of the routes listed although they are a bit sketchy. Any recommendations on accommodation or good locations in that region appreciated. We will be going for three nights so considering staying in one spot and doing ride outs or stopping in three locations. A centre point in the region would probably be Dinant maybe. Never been to Belgium so any ideas welcome. Clervaux, Echternach, Esch-sur-sure, Vianden, Ettlebruck. Just watch out for the speed camera's, zero tolerance and they will post the fines to you back in blighty, cheap enough though, and no points on licence so do not get too paranoid about it. Pick a town. Go onto Booking.com and put the town in. Chose a hotel that suits you and your companion(s) are happy with. There are loads and they all love motorbikes. I have spent a few days in Luxembourg using Clervaux as a base - recommended. Clervaux is 10 miles from the Wallonia border. There are a few hotels in Clervaux - we used Hotel des Nations. We parked on the street outside the front door but the owner has a lock up garage he will make available if you are the worrying type. We had one evening meal in the hotel which was good and a couple of excellent meals in local restaurants in the small town centre. I always think that the area isn’t big enough to warrant changing hotel every day so it’s purely a matter of how many decent bars and restaurants are there within walking range of the hotel? Go for a ride every day, stop in one of the many small towns for lunch in a bar by the local square (they all have one) then head back to base for a shower and a night out. Dinant would get my vote every time but only because I go to Chimay every year for the racing and my liver needs 12 month gaps to recover from the trauma of an evening in the Queen Mary. 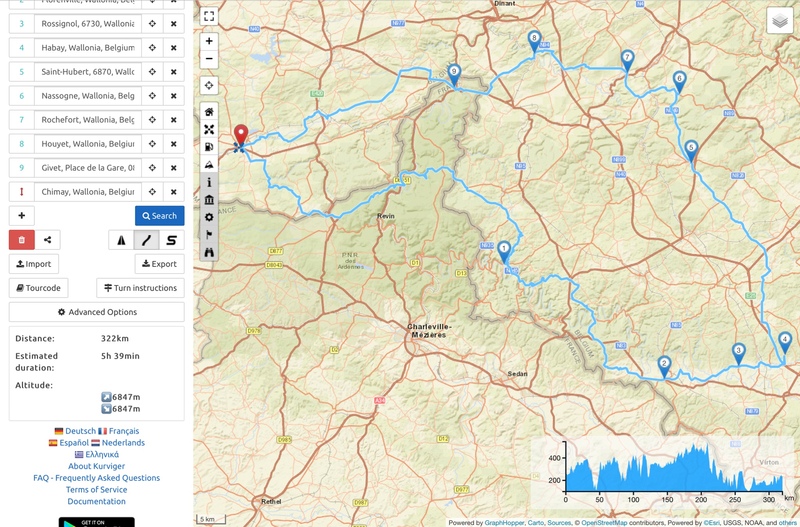 You don’t need to do a lot of route planning in the area around Dinant, simply follow rivers to find good roads with pleasant places to have lunch and if anything you can over complicate it by taking more than the Michelin map of the area and sticking it in your tankbag. Andy B’s advice is probably similar to my own and (bang on cue) mentions Dinant. Download the ADAC routes of the area. See sticky. Dinant has two minor problems, one is that it’s more expensive than most of the other towns in the region but you get what you pay for and it’s a nice place to waste an evening or two and the other is that parking can be a bit difficult in summer but it usually gets quiet in the evenings so even if you initially have to park 5 minutes away you can always move the bikes closer later on if there isn’t a dedicated car park for the hotel. I've stayed in La Roche in Ardennes a few times - great town, handy for a lot of the good roads. Bit further east (and a bit north) near Spa is a dedicated bikers' B&B run by an English couple: AE Aventures - great value, great hosts, surrounded by brilliant roads. Will file that AE adventure away for a later date; Malmady and Stavelot; are also decent places ; the whole area really is ; a pin in a map place, it's very hard to be disappointed in that region. Eight or so replies, including one to go to Luxembourg instead. What conclusion have you come to, Nick G? after reading a 'Bikers Guide to Wallonia' supplement that came in Bike magazine a few months ago. You sometimes do have to work at the suggestions appearing in magazines, as the written instructions maybe aren’t too clear or the maps particularly well done. If you are struggling, my suggestion would be to put the place names in sequence into something like Kurviger and see what it spits out. I did just that for the ‘Explore the Ardennes’ ride in the article, starting and ending the route in Chimay. It’s not too bad a version, which you could probably fine tune a bit, too. All done on an iPad in under five minutes, if only to show how easy it is to borrow or steal ideas from all sorts of sources. Then mix them in with some (free) route creation software to make yourself a jaunt with very little effort. You could finish it off by asking the ViaMichelin app for Rochefort to Chimay, via Houyet and Chimay. Crikey. Thats really helpful. Thanks for that Wapping. I'll definitely have a go at the Kurviger thing. Any chance you could PM me the way points you used. I can see all but the first two on your screenshot. I haven't finalised accommodation yet but will either stay in Diana (or Chimay) for three nights or one there and two with AE Adventures over near Spa. I'd definitely stay in Diana. All I did with Kurviger was enter the towns, starting with Chimay, in the same anti-clockwise order as they appear on the basic map in the article. Chimay > Vressse > Florenville > Rossiginol etc etc etc > Chimay to complete the circle. Just hit the + button each time you want to enter a town onto the list. You are not forced to ride the circle anti-clockwise or indeed start at Chimay, that's just what I happened to do by way of illustration. Here's the link to help you with Kurviger: https://docs.kurviger.de/app but it's incredibly easy. One tip: Like any route creator, always check what the app churns out. You don't want to find yourself down some goat track in the broiling sun, delayed by a puncture, when all you really want to be is chilling with like minds at your hotel. 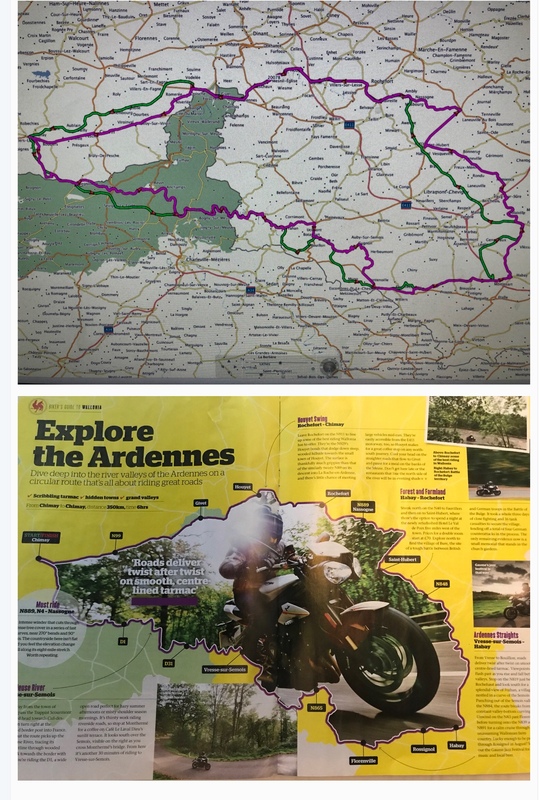 Here you go, Nick G.
With a bit of reading between the lines and imagination, I have created the magazine’s Wallonia 'Explore the Ardennes' route in BaseCamp in magenta. Alongside it, I have put the Kurviger track version, in red. The Kurviger track was made by just listing the towns from the route in the magazine in an anti-clockwise direction, as described in post 14. I have though jazzed-up the track by inserting into it the places named in the text, too. I have hosted the Garmin friendly file on Dropbox. It should run and display on any device or software that is capable of accepting .gpx data. The file should open straight up in BaseCamp or Mapsource. If it doesn't and all you see is a mass of what looks like code, DO NOT PANIC. In the transfer between a Mac and Dropbox the .gpx file sometimes gains a .txt extension, changing it into a text file. Simply save the file to anywhere convenient, your desktop will do. Rename it by deleting the .txt bit ONLY and leave the rest as ending .gpx All should then be good. I haven't checked the track or the route yard by yard but they they look near enough OK. If I have sent you down a goat track, write to your MP and complain. The magazine article says the route is 350 kms (218 miles) in 6 hours. My Garmin version is 209 miles (334 kms) in five hours 54 minutes *, which suggests to me it's as correct as it needs to be. By way of simple comparison only, the Kurviger track, is (not surprisingly) similar but different to the magazine route (as it is simply A to B to C to D to E) is 207 miles in five hours 53 minutes. * My GPS device shows it as the same mileage but taking less time; that's not surprising. I changed the colour of the Kurviger track from red to green for the shot to make it clearer.